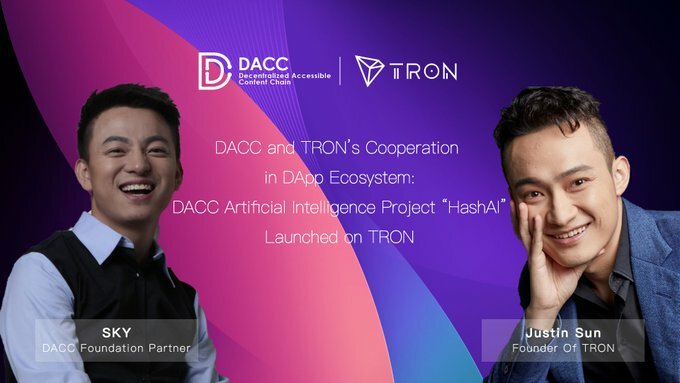 Lately, Content-based public chain DACC has successfully launched its artificial intelligence project “HashAI” onto TRON, one of the largest blockchain-based operating systems in the world. Download is now available on TRON House. HashAI, developed by DACC, can be used for money transfer and smart contract calls in blockchain through voice queries. It is now connected to TRON Network, Slack, Google Assistant and Google Home. With HashAI, users can purchase coffee through Google Home and pay with TRX. Moreover, HashAI also supports TRX transfer through voice queries with Bot on Slack. All transactions are immediately available to be seen on the TRON main network. HashAI is an attempt to expand TRX payment scenarios with artificial intelligence, while more cafés and chain industries around the world are expected to accept TRX payments for transactions. At the same time, DACC will also help promote “HashAI” by tapping into its own global community that has 1,000,000+ members, as well as through 499 Block, DACC’s subordinate community media. Sky, founder of the DACC Foundation, possesses more than ten years of experience in development of community and artificial intelligence products. Having gone through the development of the Internet, the mobile Internet, and the blockchain industry, SKY is indeed optimistic about the long-term development of both communities and tools in the ecosystem of TRON platform. He believes that TRON, as the pioneer of the integration of blockchain and online entertainment and social network, it has been leading the global market for bold innovation. As such, with its launch on the TRON network, this AI project “HashAI” by DACC will certainly activate bigger global communities, bringing more convenience and solutions to global supporters. TRON is an ambitious project dedicated to the establishment of a truly decentralized Internet and its infrastructure. The TRON Protocol, one of the largest blockchain-based operating systems in the world, offers public blockchain support of high throughput, high scalability, and high availability for all Decentralized Applications (DApps) in the TRON ecosystem. It also provides better compatibility for Ethereum smart contracts through an innovative, pluggable smart contract platform. Since July 24th, 2018, TRON acquired BitTorrent Inc., which is an Internet technology company based in San Francisco. It designs distributed technologies that scale efficiently, keep intelligence at the edge, and keep creators and consumers in control of their content and data. Every month more than 170 million people use BitTorrent Inc. developed products. Its protocols move as much as 40% of the world’s Internet traffic on a daily basis. Decentralized Accessible Content Chain (DACC) is a platform that will revolutionize the digital content and media industry. DACC will establish the first public blockchain that features identity and access management (IAM) at the infrastructure level in digital media industry. A decentralized file system that contains intrinsic identity and access management (IAM) will be implemented to give users and content creators methods to securely initiate, store, and manage access permissions to their data and IP.